The FEI Tribunal has taken its decision in the case of alleged horse abuse committed by Mrs. Amy Tryon on her horse Le Samurai while participating in the cross-country phase of the 2007 Rolex Lexington Kentucky 4-Star Event on April 28, 2007. 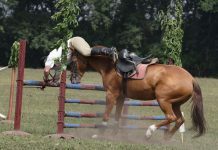 The case involved the riding of an apparently lame horse in the final moments of the course, and the state of the horse when the last fence was jumped. A hearing was held in this matter on June 25, 2007, at which the parties presented a substantial volume of evidence including testimony from a number of very experienced members of the international eventing community. The Tribunal came to the conclusion that the competitor’s behaviour at the end of the cross-country phase of the event objectively constitutes abuse according to the requirements of the applicable FEI regulation. The competitor acted, by continuing to ride after the horse was objectively lame and injured. Conversely the competitor omitted to act, by failing to pull up the horse when she could have. This caused or was likely to cause pain or discomfort to the horse. – a cost contribution of CHF 1,500 towards the legal costs of the judicial procedure. The full text of the decision (30 pages) is available on the FEI website, www.horsesport.org, under LEGAL/DECISIONS. I’m glad they finally made a decision, that’s all. It’s not like the can bring Le Samouri back no matter what they do, but I hope this will make future riders more aware of their horse’s condition as they ride. I agree. What she did was wrong, I still believe a rider of that level HAD to know the horse was lame, however, only she knows what she felt and made her decisions based on that. I feel that as this was not premeditated, she should definitely be punished but not banned for life and not carry the stigma of “horse abuser” with her.